Species of Saccharomyces particularly S. boulardii are gaining popularity as promising probiotic organisms. This organism acts by releasing bacteriostatic or bactericidal substances, which inhibit pathogenic effects of bacterial toxins, has anti-secretory action, and shows trophic, immune-stimulatory and anti-inflammatory response. Evidence showing the anti-diarrhoeal activity of lyophilized S. boulardii in various diarrhoeal diseases is well documented. Numerous randomized controlled trials have shown that S. boulardii prevents acute gastroenteritis, enteral nutrition-related diarrhoea, traveller’s diarrhoea and decrease the symptoms related with Helicobacter pylori treatment. S. boulardii effectively prevents Antibiotic Associated Diarrhoea (AAD), treating irritable bowel syndrome and recurrent Clostridium difficile disease. This yeast has shown promising results when used for the treatment of human immunodeficiency virus-related diarrhoea, giardiasis and Crohn’s disease. Yeasts are superior probiotics over bacteria as they are naturally resistant to conventional antibacterial antibiotics. S. boulardii is, thus, commercially available as a safe and well-tolerated probiotic. 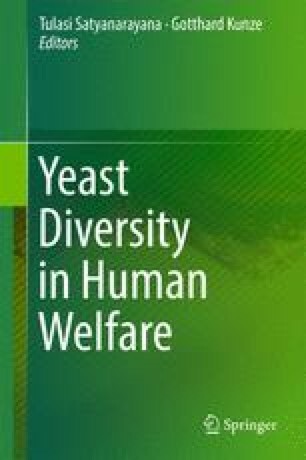 This chapter discusses various aspects of probiotic yeasts and their role in human well-being. Agheyisi, R. 2014. The probiotics market: Ingredients, supplements, foods, Report code: FOD035C, BCC Research, Wellesley, MA, USA. (http://www.bccresearch.com/report/FOD035B.html). Ferreira, C.M., Vieira, A.T., Vinolo, M.A.R., Oliveira, F.A., Curi, R. and Martins, F.D.S. 2014. J. Immunol. Res. 2014: 10.1155/2014/689492.